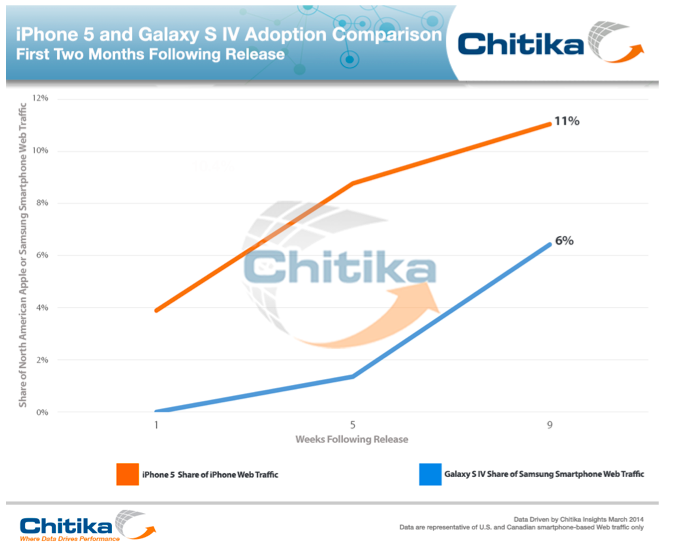 The report, by Chitika Insights, profiled the web analytics of Apple's late 2012 iPhone 5 and Samsung's early 2013 Galaxy S4, charting (above) the adoption of each model over the first two months of each model's release. "Just one week following the iPhone 5 hitting the shelves at U.S. and Canadian retailers," the report noted, "the device's users were already generating close to 4% of all iPhone traffic across the continent." The report also observed (below) that, "despite Samsung not besting Apple in terms of adoption of its flagship smartphone, the Korean company has succeeded in dominating the North American Android marketplace." 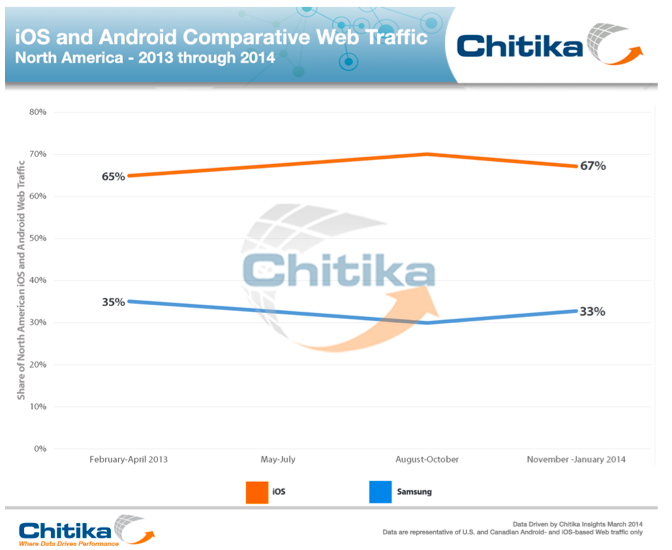 Overall, Chitika's comparative web traffic statistics indicate that Apple's share of all North American traffic grew by two percentage points between February 2013 and January 2014, increasing from 65 percent to 67 percent, while Samsung's declined by two points, falling from a 35 percent share to 33 percent. "Continental usage of Apple products generally outperform its market share," Chitika stated, "likely indicating that users are highly engaged with the company's devices as compared to those of its competitors. 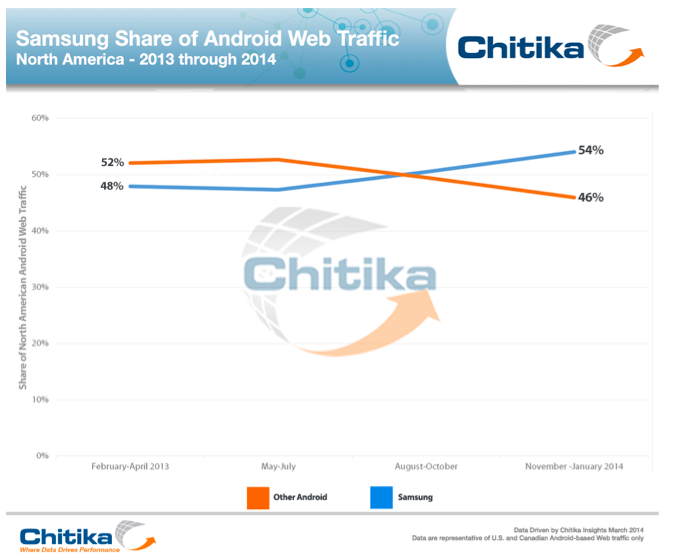 Samsung has invested heavily in the North American mobile marketplace, and its devices easily drive the most Android Web traffic." Samsung's dominance among Android smartphones is a particular concern for Google, as the Korean conglomerate has been working to deliver its own Tizen, a Linux-based mobile operating system that the company wants to use as a drop in replacement for Google's Android. The company has already migrated its watch product to use the new software instead of Android.